During 1960, Soviet Premier Nikita Kruschev made a State Visit to France. While there, he was deeply impressed by the Sud Aviation Se.210 Caravelle's quiet cabin. Upon his return home, he immediately directed Andrei Tupolev to develop a Soviet airliner with a similar rear-engined design. Tupolev was at the time just finished developing the Tu-124 medium-ranged airliner, and in his characteristic manner, used a great deal of the -124's design and structure in the new aircraft. The Tu-134 entered service in 1967 and was an immediate success both at home and abroad, with 852 examples coming off the production line. 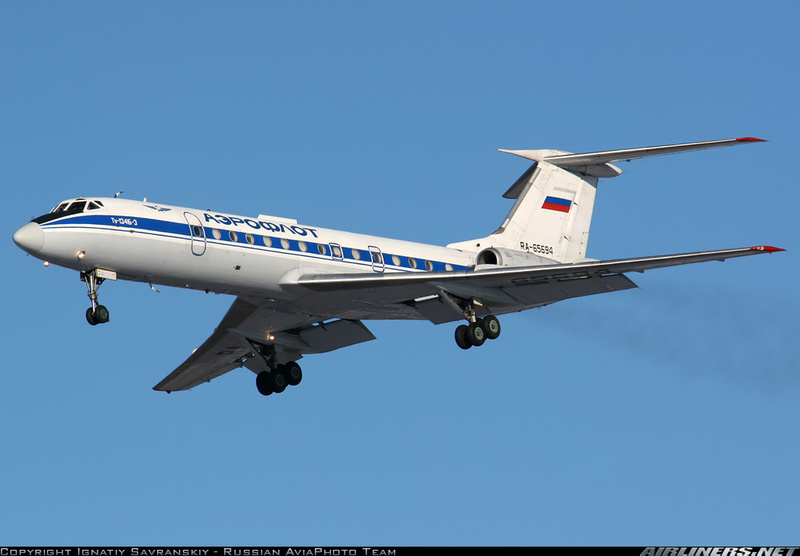 The last Tu-134s were finally removed from service in 2012 because the fleet was not able to be equipped with ground proximity warning devices. The kit comes packed in a very sturdy cardboard box with a flip-top lid under the traditional removable box top. The mouldings are crisp and clean, with very little flash and no sink marks. The fine scribed panel lines are out of scale for 1/144 but will still look good under a coat of paint. The panel lines match up very nicely. The plastic has a slightly satin texture which can be polished out, but which will disappear under the primer paint. It is noticeably smoother than previous Zvezda airliner kits have been. The fuselage is two halves from nose to tail. The cabin windows are open, with clear parts provided for them. The cockpit windows are included with part of the fuselage top similar to the way the Tu-154 was done. The panel lines are nicely engraved and match up well. The APU exhaust is blocked off, and could benefit from being drilled out. Be careful not to drill right though the bottom of the fuselage. If the windows are left open, the interior should be painted black to prevent the model from looking toy-like. There is no cockpit bulkhead to help confine the nose weight, which Zvezda says should be 5g. The nose gear well must be inserted before the fuselage is closed. The rudder is a separate part. Separate clear and solid nose caps are provided for the A and B-3 versions respectively. There are also separate larger emergency escape doors provided for the B-3 option which will require the existing doors to be carefully cut away from the fuselage following the engraved lines inside the fuselage. The antennae and air data probes are separate, and very finely moulded. Care must be taken when removing them from the sprue gates if they're not to be broken. The wings have a one piece lower half comprising a portion of the lower fuselage and the inner 2/3 of the lower wing. Each upper wing has the outer third of the lower wing. The trailing edge is moulded into the upper wing halves. The wings will need a little work to ensure that there is no step in the lower surface. The wing fences are moulded integrally with the upper wings. There is no structural detail in the wheel wells. Some may be added if you wish but they are quite small, and your work may not be seen. The tailplanes are one piece mouldings that are moulded with the fin tip in the same manner as the Tu-154. Again this will necessitate some tricky masking come painting time. The engines are a two piece cowling separated top and bottom complete with the entire pylon Separate intake and turbine fan discs insert into the lower cowling, then a separate cooling air scoop is applied to the outside. The moulding of the fan blades is extremely fine. The landing gear struts and wheels are finely moulded and nicely detailed. They could use some brake lines and whatever else the modeller likes, but will look good without it. The wheels themselves are properly thick and the detail moulded into the hubs is very good. There is an option for raised gear, and a very large heavy stand is provided. As with all 1/144 kits, the gear doors are overly thick and may be replaced if the modeller wishes although Zvezda has made an effort to get the door edges thin and they have nice mounting tabs. Markings are provided for Aeroflot's 1973 blue scheme. There is a glass-nosed Tu-134A from 1977 and a solid nosed Tu-134B-3 from 2001 The main difference in the colour schemes is the Russian flag in place of the Soviet flag on the latter aircraft. The decals are still in Zvezda's characteristic matte finish, but the printing is much sharper, and for the first time includes metallic silver for the cabin window outlines and landing lights. No window decals are provided for those who prefer them. If desired, they may be sourced from an F-dcal, Pas Decal or Two Six decal sheet. Those 3 suppliers offer several different alternative colour schemes if you don't wish to do the kit scheme. Lows: Delicate parts mean that they can easily be broken or lost. No window decals. Verdict: This kit is another one of Zvezda's beautiful airliners and will be an ideal starting point for builders new to the airliner modelling genre.